There's plenty of hype around Fuzzy Sun at the moment with their debut EP Want Love just having been released on Blossoms' Very Clever Records label. A big shiny production on the record asks the question whether the still fledgling band can cut it live. In the hot and sweaty packed basement of Jimmy's, they gave us an unequivocal yes as an answer. There's an expectant crowd by the time Fuzzy Sun have fought their way through the crowd to the stage, a series of sixties and seventies classics having warmed the audience up for what's to come. Right at the centre of what makes Fuzzy Sun stand out is the interchange between Kyle and Daisy's vocals and they use it to even more potent effect live than they did on the record, particularly on So Sad. It gives these songs a depth and a warmth that they wouldn't possess with just one vocalist in the band. It also allows them to keep things simple and short and sweet. 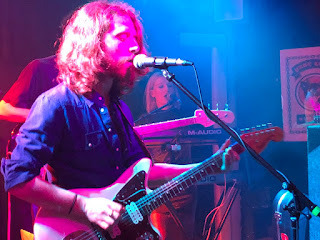 There's no need for pyrotechnic guitar tricks and solos, theatrics or showmanship, Fuzzy Sun's modus operandi is to simply leave you swooning at their gorgeous control of melody and rhythm and their ability to nail the pace of a song right on. Close your eyes and you could be transported to the other side of the world, where it's warm and sunny and the music forms the soundtrack to having the best time. They play the four songs from the EP and it seems now that most of the audience are acquainted with them, particularly the title track. After All This Time opens up the show and sets their stall out as Kyle and Daisy lift the relatively simple structure of the song out of the ordinary; a trick they pull off across all seven songs which have a commonality of purpose to them, but which each live out their own personality. Crocodile Tears, I'll Be The Man and in particular a third track that they don't tell us the title of show that they're continuing their rate of development since their first shows late last year with new material that's both a continuation and a progression. They don't say a lot either, other than when Kyle loses his pick-up inside his acoustic and Daisy is forced to tell a bad joke about cheese, but they've still got stage presence without being too full on. Before they close the evening with Come Take A Bite, Kyle introduces the rest of the band, thanks the support acts and the sound team and it's the most he says all evening. But that's alright because the music does their talking for them. Their set might only be seven songs long right now, but that doesn't matter at all. In fact, it does what a band starting out as they are should aim to do, leave us wanting to hear a lot more. Fuzzy Sun are on Facebook and Twitter. Our review of the Want Love EP can be found here. The final show in their residency at Jimmy's is on April 6th and they also play The Gladstone Club in Northwich on May 18th as part of The Charlatans North By Northwich festival as well as supporting Blossoms on their UK tour.